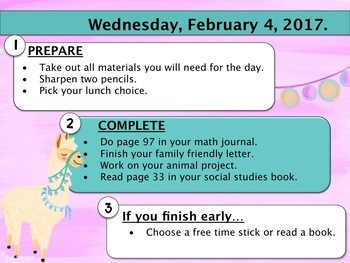 Morning Message Assignment Slides "Watercolor"
Morning Messages Assignment Slides "Cactus"
Morning Messages Assignment Slides "Dinosaur"
Morning Messages Assignment Slides "Llama"
Morning Messages Assignment Slides "Tropical"
Tired of writing the same thing on the white board every day? 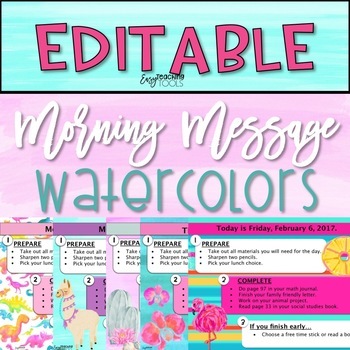 These Morning Message Assignment Slides "Watercolor " edition are editable so you can type in your instructions for your students. 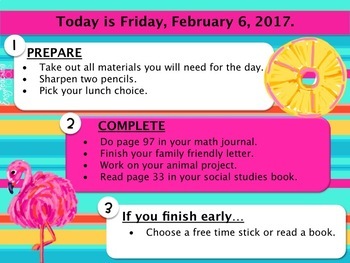 They are perfect for morning meeting, announcements, journal writing, morning work, transitions, directions, dismissal, and more! I use them every single morning. As the students walk in, I don't have to say a word. Everything they need to know is on the slide that's projected on the board. You can use them during your math, ELA block, or even as you're switching desks. Each slide has a different background that's ready to be customized with instructions. Just click on the text box and edit it to fit your needs. 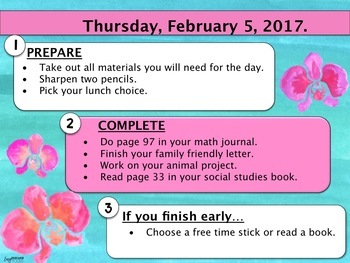 *You will need power point or Google Slides to use this resource.